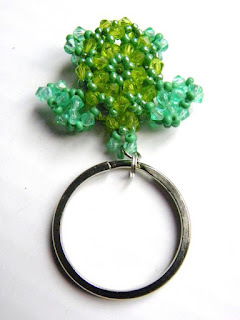 Pipa the Latest: journal of a messy crafter: Why beadwork is better: UNIQUENESS! If you're still wondering why buying and gifting beadweaved objects is better...the "Wow effect" is the answer. You will always have the "Wow effect" with something beaded. Beads are everywhere, but beadweaved object are not. Thousands of people can beadweave, but only few of them show it to the world on blogs or have online shops. Many of them make really big, complicated and expensive jewelry which are not affordable by anyone (even though EVERYBODY would dream about buying one!). Simple and original beaded objects are not that common. Finding an artisan who can make something personalized to give might be the best occasion to make a wonderful present spending less than you would ever think. My first sale ever on etsy was this turtle keychain. It was december and this guy bought it telling me it was a surprise for his girlfriend, who was about to receive a lot of turtle-themed presents for Christmas. He was so excited about something so small, because it was unique. He might have found turtle-mugs, t-shirts or toys, but beaded turtles? Mine was the only one. 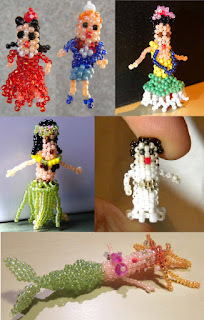 Another example are beaded dolls, that you can shape to look like the recipient (as I did with a swap partner) or a cartoon charachter. Just a small pendant you can attach to a key-ring, to a USB pen drive or to a cell phone can be a beautiful present. Something you'll never find anywhere else.